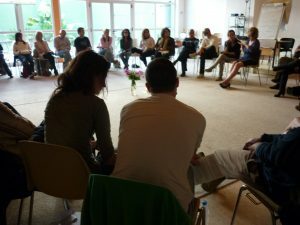 The Catalan Transpersonal Association (ACT) was born in 1997, driven by a group of people linked to the world of psychology, science and spirituality, with the will to disseminate and develop the Transpersonal movement. To this end the association organizes different types of activities (gatherings, meetings, themed dinners …), promotes publications throughout the year, interweaving Spirituality, Psychology, traditional wisdom and progressive social transformation. The objective of the association is thus to put in contact all those people with an open spirit (without exclusions of any kind), who have an interest in the inner growth, in the development of the conscience and the spiritual emergency, with the attention in a wide range of disciplines ranging from psychology and psychotherapy, through various spiritual practices to the sciences of communication, anthropology, medicine, artistic creation and other activities related to the holistic perspective. The Transpersonal movement was born in the USA in the 50s and 60s, in the midst of the revolution and arrival of all the spiritual traditions from east to west. This fact will generate a series of chain reactions to date. In the European Transpersonal Association, which responds to the acronym EUROTA, we find many countries of the former Eastern Europe, starting with Russia, Moldova, the Baltic Republics, Estonia, Latvia and Lithuania, Romania, Bulgaria, will soon incorporate the Czech Republic, Poland, Ukraine, apart from, of course, all the member countries of the European Union such as France, Germany, Italy, United Kingdom, Belgium, Ireland, Denmark, Portugal, Greece, Sweden, Norway, Holland, Switzerland and some others. And also countries in the Middle East such as Turkey, Israel, South Africa and even Australia and New Zealand. A parte también existen la Asociación americana, la Internacional y la recientemente creada Iberoamericana.